You’ve heard of RSS? You’ve seen those small funny tags on websites? You’ve heard co-workers and acquaintances swear by it, but still have no idea what RSS is? Well don’t worry, you’re still in the majority, but this is changing rapidly. In the information world, RSS is not only revolutionizing the way news, media and content creators share information, but it also is swiftly changing the way everyday users are consuming information. RSS stands for “Really Simple Syndication” and is a file format for delivering regularly updated information over the web. Just think about the websites and news information sources you visit everyday. It takes time to visit those sites and scour the ad-filled and image-heavy pages for just the text you want to read, doesn’t it? Watch this video at BlipTV. 1. Follow these discovery exercises to set up your own, personalized RSS feed reader. 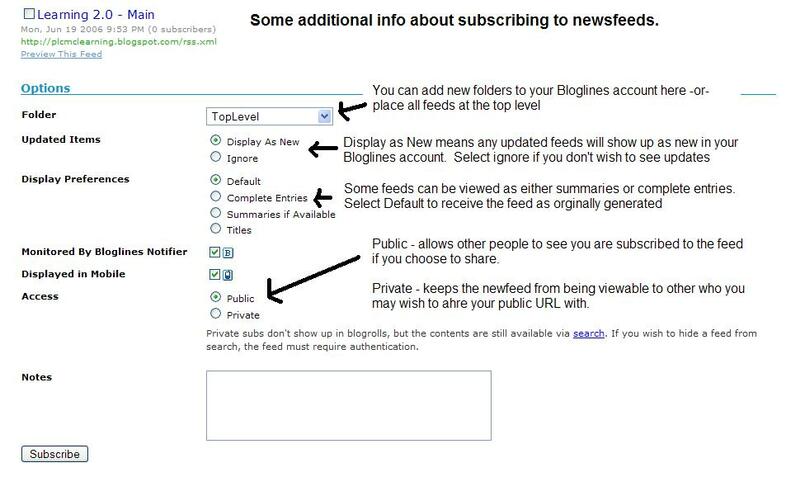 Learn about the difference between RSS feed readers, Bloglines, and Google Reader. What is RSS? Video by Common Craft. How to Make your RSS Feeds Pop! Check your local newspaper and discover if they have an RSS feed you can subscribe to. Additional Bloglines news feed subcription information · Your co-workers or members of the Virtual Services Task Group - tap into their knowledge and experience with RSS feeds and readers.